Reading aloud to my children has been one of the perks of parenthood. It’s fun, it’s cuddly, and when the husband or I are doing it, I’m confident we’re engaged in something proven to help our kids succeed. Plus, how else can I foist my favorite titles on them and be sure they’ll read them? Call it inspiration, or just competitiveness, readers, but that library event got me thinking there had to be a way to read aloud to both children simultaneously from Great Literature. I decided to forget the big books and focus on poetry. Poetry was the way to find short, discrete, literature to read every night, whether or not both kids or both parents are home. I love poetry. I used to write it. I have even published a poem. The 5th grader also likes to write poetry. Turns out she loves to read it aloud, too. So for the last several months we have read two poems a night, one she reads, one the husband or I read. We read at dinner, because dinner happens every night, even if one or another of us isn’t home. As I mentioned in a previous post, the rules are simple: Pick a poem quickly, at random if desired, and make sure it’s less than a page long. The habit has stuck, and I have realized another value of poetry. It touches on the soul, heart, and spirit. In our secular Jewish household, one of the things I fret about is the place and time to bring up these questions of soul, heart, and spirit that people find in formal religious instruction. After all, these are the questions that form character. Molding character is the goal of parenting, isn’t it? I recently read an interview with pediatrician Kenneth Ginsburg in which he reminds parents that the goal of raising children is to raise them to be successful thirty-five year olds. Meaning there’s a whole life involved, with work, and relationships, and a place in the world. Success in childrearing doesn’t end at getting them into college. Therefore, thinking about the big questions is crucial. Yes, that's right. And yes, I did discuss the meaning of pubic beard, and mentioned the word merkin, which is actually a pubic wig. This of course required further explication (used a long time ago, probably to hide evidence of sexually transmitted diseases.) Right after I finished defining merkin, I remembered the mom I really like at the 5th grader’s school who had just that day mentioned that she didn’t let her kids read Calvin and Hobbes because its content is too mature. 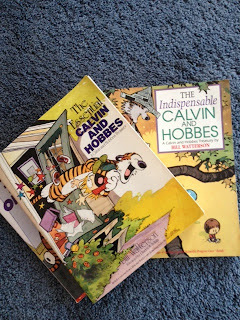 So, readers, I had a moment of cognitive dissonance, a moment of hearing my voice finish defining merkin while simultaneously experiencing the enormity of my difference from the nice mom, because the 5th grader has not only read all five of our Calvin and Hobbes collections multiple times, she did so starting at an age - OMG what have I done - so young I can’t remember, maybe 6, definitely 7 or 8. Let’s make me look better and say 8. She read with the intent only a child trying to suss the adult world could read---utter, obsessive, perplexed, fascinated. Plus, she now knows the definition of "merkin." In his defense, let me just say that the husband was not present during this poetry reading. He was tending to the sick, because life, like poetry, is grounded in the physical. Admittedly, sometimes poetry, like life, is the opposite of soul and spirit. That's okay, though, right? Furthermore, isn't one of the perks of childhood puzzling over the mysteries of adults?